Ultimate Teacher Pack includes Prep 1, Prep 2, Basic, Intermediate, Advanced and the Complete Music Theory Rudiments Workbooks and Matching Answer Books. 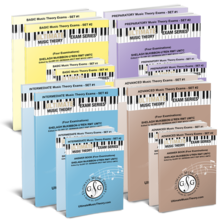 Ultimate Teacher Pack features all 12 books including the Prep 1, Prep 2, Basic, Intermediate, Advanced and Complete Music Theory Workbooks and Matching Answer Books. UMT Answer Books (coil bound) are a convenient 5 X 7 size.